Peer reviewers do not need salaries or overhead rates to evaluate the cost reasonableness of ROSES proposals. Thus, proposals should not include costs of salary, fringe, or overhead anywhere in uploaded proposal PDF, including the budget detail or justification sections in the main proposal, which will be seen by peer reviewers. Unless otherwise specified by the program element, all proposers must include all costs, including salary, fringe and overhead of NASA civil servants and all subawards and any separate Co-I awards in two places outside of the uploaded proposal PDF: the NSPIRES web page budgets and the separately uploaded "Total Budget" PDF file. We will begin with the NSPIRES web page budgets and return to the separately uploaded "Total Budget" PDF file later. Almost all ROSES program elements are set up to allow proposers to fill out the NSPIRES web page budgets. Unless otherwise specified in the ROSES program element, these NSPIRES web page budgets should include all costs, including salary, fringe and overhead of all participants. The NSPIRES web page budgets will not be seen by peer reviewers. These NSPIRES web page budgets are not required for Step-1 proposals. Where more than one organization is involved then the total cost for the Co-I organization is simply given as a single number in row 5, 8, or 9 of Section F. When funds are going to Co-I organizations funded directly by NASA, such as NASA centers and other government labs then lines 8 or 9 should be used and customized. All proposers, including NASA centers, must include the cost for the time (and fringe) of the PI and all Co-Is from your organization in Section A. Senior/Key Personnel, see Figure 1, below. Paid team members from your organization who are not Co-Is (e.g., students or technicians) go in Section B. Note, commas between entered numbers will give an error. Once you have correctly entered the salary and overhead numbers from your organization for the team members and save it then the system NSPIRES will total it up for you. When the proposal is evaluated by the peer review panel they will not see any of the $ numbers in the Personnel Sections (A & B), or the overhead in Section H, all of that will be automatically redacted. No $ for anyone’s salary, fringe or any organization’s overhead should appear anywhere in the body of the proposal. All NASA funds for all organizations participating in this proposal must be in the NSPIRES cover page budget so that the total is correct. See the next section if you have funds going to another organization in addition to yours. All NASA funds for all organizations participating in your proposal must be in the NSPIRES cover page budget somewhere so that the total is correct. However, there are two very different ways that organizations working with you will be funded: Funds for Co-Is at non-governmental organizations (like universities, research non-profits, or subcontracts commercial vendors) will pass through your organization i.e., the funds will come to your institution and then you will send it to them via a subaward of some kind. For those pass through awards your organization may collect some kind of overhead (typically up to a certain threshold). We’ll deal with these subawards to non-governmental organizations in the section 4, below. But first, we need deal with any funds going to government labs, such as NASA centers, including JPL. Your NASA program officer really needs to know about any funds going to a governmental organization because it’s that person’s responsibility to send the right amount the right place. If you have any funds going to organizations other than your own its imperative that you break this out clearly in the cover page budgets and separately upload a "Total Budget" PDF. If you don't have any funds going to a government lab or NASA center, you may skip ahead to Section 4. Any proposer who plans to have funds sent to a government lab should read this section carefully. These instructions about Government Co-Is are the same whether the proposal is from a university with a funded NASA Center Co-I or if it's a proposal from one a government lab with a Co-I at another government lab. Funds for government Co-Is will not pass through your organization, your organization may not collect overhead on that portion of the award, those funds will be split off and sent directly from NASA HQ. However, those funds still must appear in the NSPIRES cover page budget. The best place for those is in Section F lines 8 or 9. Those lines are blank and you can type anything you want in there, so you can tell the program officer where those funds are going, see Figure 2, below, in which I have noted that the $150K in line 8 is for my Co-Is at the Naval Research Lab, and the $80K in line 9 is for my Co-I at Goddard Space Flight Center. Don't use line 10 for salary or overhead, its not redacted. If you have funds going to a government organization you really should get a detailed budget from them, phased by fiscal year, and include that in the separately upload a "Total Budget" PDF. One may also use line 5 for a subaward to a government lab as well, but the generic subaward line in Section F line 5 cannot be customized, so generally its used for pass through sub awards of the type described in the next section. In any case, lines Section F lines 5, 8 & 9 will all be hidden from the peer reviewers but seen by NASA, and the budget justification section of the proposal should explicitly state which lines are for which organization. This is especially important when using line 5, since there would otherwise be no way of knowing what that's for. If you have three or fewer other funded organizations then put them separately inSection F lines 5, 8 & 9, break out procurements in the detailed budget, and rationalize procurements and time of investigators in the budget justification section. If you have more than three organizations in addition to your own that are receiving funds via this award then you will have to combine at least two. If you have more than one subaward to a non-governmental organization passing through your institution then combine those first, they are all going to your organization anyway. If you have Co-Is at more than three different governmental organizations then combine those in one of the customizable lines (Section F lines 8 or 9) as seen in the example below and definitely upload to NSPIRES a separate detailed "Total Budget" document file that explains all of this. Again, do not use line 10 for salary or overhead because it’s not automatically redacted. When the proposal is evaluated by the peer review panel they will not see any of the $ numbers in the Personnel Sections or in Section F lines 5, 8 & 9, all of that will be automatically redacted. Funds for non-governmental Co-Is at other organizations pass through your organization and go in Section F line 5. Subawards/Consortium/ Contractual Costs, or in lines 8 or 9, which are customizable, if you have not already used lines 8 and 9 for funds going to government labs. If you have three or fewer other funded organizations then put them separately in Section F lines 5, 8 & 9. As above, in Section 3, if you have more than three other funded organizations then some of them will need to be combined. Always combine the funds for the non-governmental participants first, because those are passing through your organization. Always keep funds for government labs separate in lines 8 and 9 if you can. I was recently asked about whether costs of consultants, as opposed to Co-Is, should be redacted since, usually, most if not all of the consultant cost is time. Even for consultants please don’t include salary, fringe and overhead costs in the main proposal PDF. What we expect is a single total $ value for the consultants in the NSPIRES cover page budget on the line in Section F for Consultant Services and then in the budget justification in the main proposal PDF you explain only the part that is not labor e.g., "The total cost of the consultants Goldshtik and Whorfin of the Banzai Institute is provided in the NSPIRES cover page budget in Section F line 3. Of those costs most are labor and thus not shown here, consistent with ROSES rules regarding redaction, but the consultancy also includes the cost of the rental of an oscillation overthruster from Professor Tohichi Hikita of Nagoya university at $157/hour. This cost is quite reasonable given that similar facilities are twice as expensive." You include the cost of the things not the person’s time. 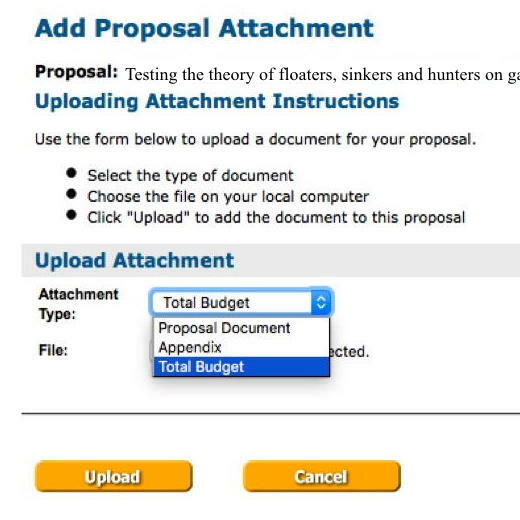 Almost all ROSES program elements are set up to allow proposers to separately upload a "Total Budget" PDF along with their (full Step-2) proposal. Unless otherwise specified in the ROSES program element, all proposers are required to include this separate Total Budget PDF. The total budget should simply include the full and complete budget spreadsheets from your proposing organization and that of your Co-Is. This means that proposers need to get this information from their Co-Investigators whether or not they are Civil Servants. Budgets are generally laid out by project year but since NASA Civil Servant salaries must be charged to present fiscal year dollars, proposals that include NASA Civil Servant salaries may need to phase the funds for NASA Centers by fiscal year. The Total Budget PDF must lay out clearly how much is going to each organization, indicating whether the funds are passing through the proposing organization and which are not. Where the funds are passing through the proposing organization to a Co-I organization, the Total Budget PDF must specify any overhead charged on funds passing through. Such charges never apply to funds sent directly to Co-I organizations such as NASA centers and other government labs. The Total Budget PDF is uploaded in exactly the same way that the proposal PDF is uploaded, but by choosing document type "Total Budget", see figure below. This Total Budget file will not be seen by peer reviewers. These budget files are not required for Step-1 proposals. If you have questions feel free to send then to sara@nasa.gov.